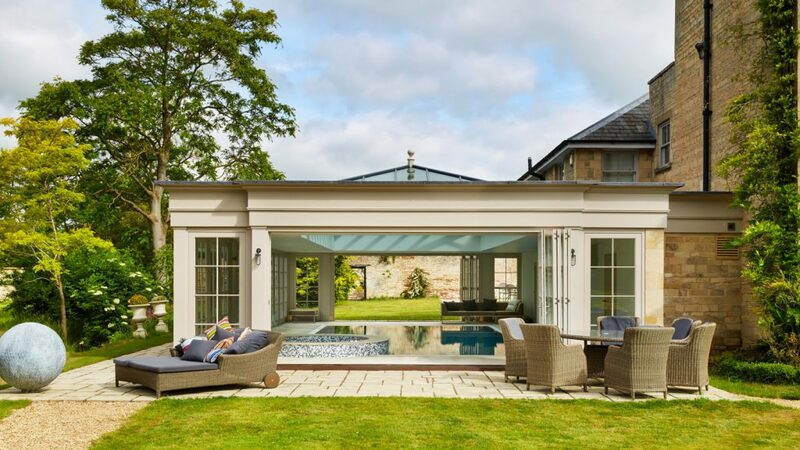 A bespoke pool house is commonly used to provide permanent cover of a swimming pool whilst still connecting the space with the outdoors. Alternatively, they are used as a summerhouse, or a place to house facilities, such as changing, shower and pump rooms for an outdoor pool. When reviewing pool house designs, it is important to consider not only how a pool house will look, but also how it will perform. 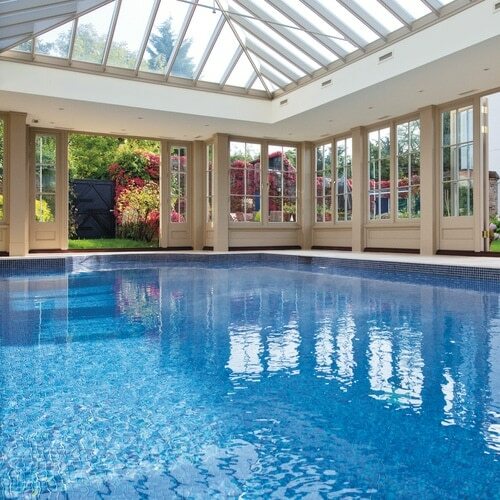 The conditions of a pool house are very different to any other building as air handling and heating are essential to eliminate condensation and ensure the pool house is comfortable. Glazing with silicone, and paint of the correct specification are essential to stop the building degrading over time. It is preferable to have a semi-glazed, as opposed to a fully-glazed roof as it makes it easier to maintain the proper climate-controlled environment inside; preventing condensation from building up on the glass and any potential cold spots. 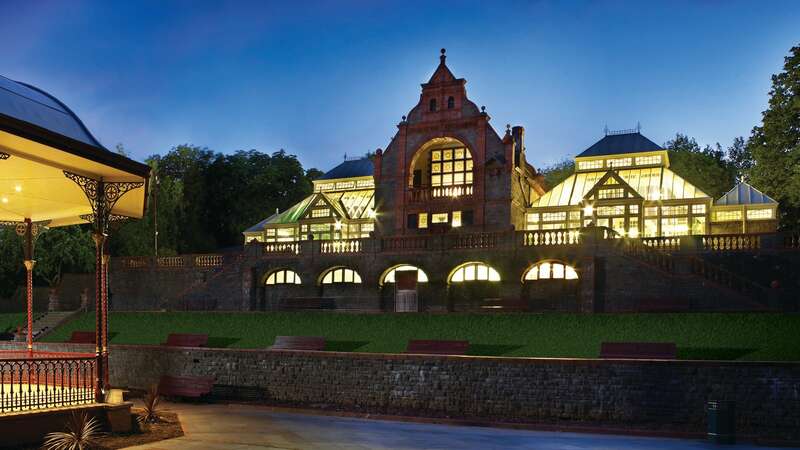 Pool houses often incorporate solar reflective glass lanterns and gables in order to illuminate the water and other specified areas, allowing views of the sky without excessive glare or too much solar heat gain. They also create a feeling of space, and a greater connection with the outdoors whilst swimming. 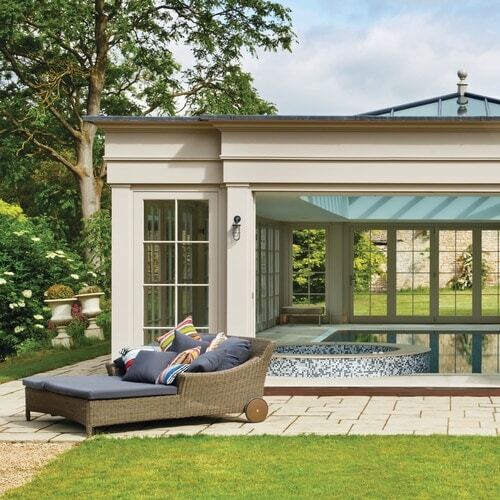 Pool house designs often replicate those of a garden room or orangery-style building, having many sets of double opening doors or retractable sides. In the summer months, opening all the doors of a luxury pool house will allow the space to be extended into the garden and make the most of your garden views. An indoor swimming pool provides a private and exciting place to have fun with friends and family, as well as a personal space to exercise or relax in the comfort of your own home. The patio area outside of your pool house provides an ideal space whether entertaining guests or sunbathing in privacy. 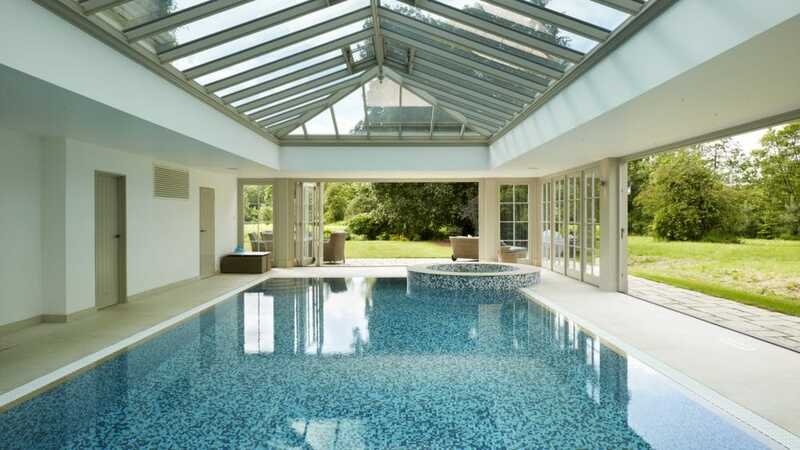 Our experienced team can create bespoke pool house designs, helping you to consider requirements for the space, and guide you through the decision-making process.